XNP-6370RH2M H.265 NW 37x IR PTZ Camera• 16 : 9 Full HD (1080p) resolution support • 6 ~ 222mm ..
TOA TS-801 Chairman UnitThe TS-801 is a Chairman unit of the Infrared Conference system. Since the s..
ND86 Dynamic Supercardioid Vocal MicrophoneExcellent acoustic control in even the largest of venuesR..
HW 261N SUPRAPLUS WIDEBAND CONTACT CENTER HEADSETP/N: 64339-31It's not just what you say, it's ..
PANASONIC WV-SC384HD Dome Network Camera12 V DC or PoE:NTSC, PAL･ 720p HD images up to 30 fps･ Newly..
SNP-6320H2M H.264 NW 32x PTZ Camera• Max. 2M (1920 x 1080) resolution• 16 : 9 Full HD (1080p) resolu..
BOSCH LBC1400/10 Volume control, 12W (BS)Commercial Type No. : LBC1400/10 Product No. : F.01U.020..
QRN-8108CH 8M H.265 NVR• Up to 8CH, 8megapixel camera supported • H.265, H.264, MJPEG codec sup.. 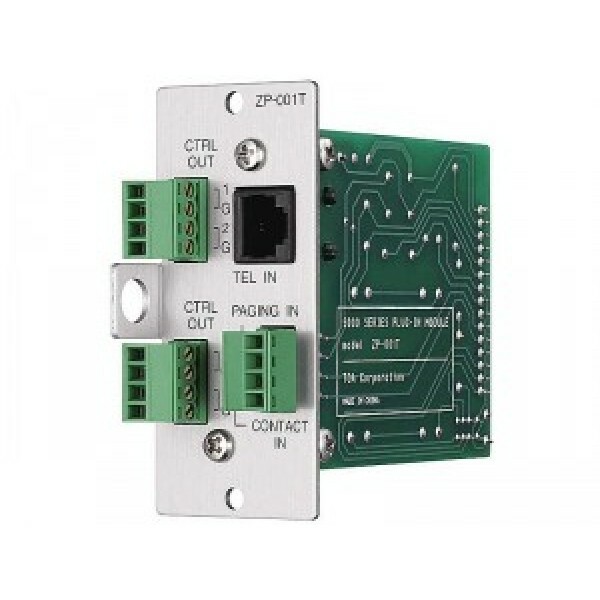 The ZP-001T is a zone paging module designed for use with the M-9000 and functions as interface to connect the M-9000 to an analog PABX, allowing zone paging to be initiated from the PABX. There are two operation modes: ring signal and paging port modes. Broadcast can be initiated regardless of operation mode. loop voltage: 24 V DC or more, which should be supplied from the PABX.